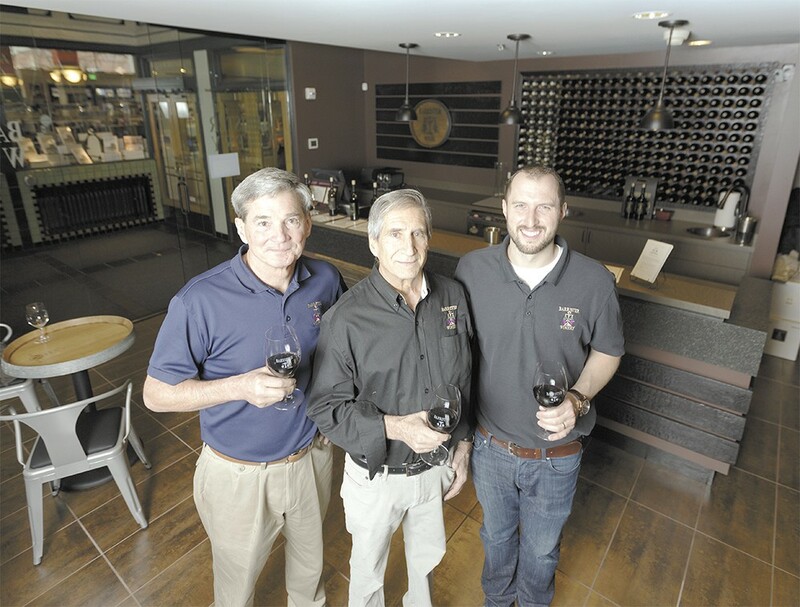 FROM LEFT: Barrister Winery's Michael White, Greg Lipsker and Tyler Walters at the winery's new tasting room. Greg Lipsker and Michael White like to say that they started Barrister Winery by accident. The two, Inland Northwest attorneys who became fast friends after meeting through work, were on a family trip through Nelson, British Columbia, when they realized that they didn't have any wine. "I thought he'd bring the wine and he thought I'd bring in it," recalls Lipsker. So they pulled over at a store with a sign proclaiming "Wine Shop," but once inside, they realized the place didn't sell bottles of wine at all, but rather winemaking equipment. "We'd always thought it would be fun to make wine," says White, so the pair left the store with a 5-gallon Zinfandel kit. Very few impulse purchases lead to a new career, but that's basically what happened on that afternoon in Canada in 1997. "Who knows if we'd even be sitting here if we hadn't made that stop," says White. He's sitting with Lipsker and longtime Barrister employee and new equity partner Tyler Walters at the winery's just-opened tasting room in the Liberty Building, just across Washington Street from the Davenport Grand Hotel. This year, Barrister is on pace to produce 5,000 cases of wine, more than doubling the production the company's original business plan foresaw when it was written almost 15 years ago. Back then, Lipsker and White had transitioned from making wine as a hobby — at one point crushing a ton and a half of grapes in a garage — to forming the actual Barrister Winery (named after their shared profession) in 2001. A few years later, they purchased a historic building in the Union Pacific Railroad alley where they've since made and aged their wine. It's also become a popular spot for wine tourists, as well as an events space. "I don't think we ever set out to have this be our life's work. It was something we both enjoyed, but I don't think we had a vision of what it's become," says Lipsker. The new tasting room allows Barrister, for the first time, to have a visible storefront location in the heart of downtown. Though not far off the beaten path, the winery takes a little Google-mapping or sign-spotting to find on your first visit. Barrister has managed to transcend that by building a loyal customer base, one they say has come by word of mouth and handshake by handshake. Visitors to Barrister often encounter Lipsker, White or Walters, and can readily inquire about the wine or take a look at their barrel storage. "It's important for us to have a connection with everyone who walks in. We want someone to walk away knowing that the wines are really wonderful, and also the experience is really wonderful," says White. Barrister also has found success with a wine club they formed in their early days, hoping for maybe 125 members. Today, the group includes more than 1,100 Barrister devotees, as much ambassadors for the Spokane winery as they are fans. "We'll have a wine club member in Florida who will share wine with their neighbor, and then that neighbor will become a member," says Walters, who has worked his way up the ranks at Barrister, learning the wine industry along the way. Most of Barrister's business remains in Spokane, and they have no plans to distribute much out of the area, saying they're comfortable with their size and proud to identify as a Spokane brand, part of which is being an urban-style winery without a vineyard. Operating out of a city center means that Barrister can source its grapes from 10 vineyards in three wine regions throughout the state. This way, they remain a Washington winery, but benefit from being able to pick and choose their fruit. Having both their winery and tasting room in downtown Spokane also means they can benefit from the boom in wine tourism the city is experiencing, which Barrister has helped engender over the course of their decade and a half in operation. "It's been wonderful to have the explosion of wineries in Spokane because it speaks to the quality of Washington wines," says Lipsker. "It's also given us a critical mass for tourism." While the tasting room likely will bring in new customers, Barrister has no plans to change things at the winery. They'll continue hosting art shows, as well as the 100 or so events annually, including weddings, that have been a hallmark of the winery. They say to think of the tasting room as a gateway to their original location, and their brand as a whole. And for a place that's taken some research just to find, they don't mind the exposure.